Benchmark 62% iron ore fines at China's Tianjin held steady at $151.90 on Tuesday, not far off 16-month highs. Iron ore is trading some 75% higher than September when the commodity hit a 3-year low of $87.50 at tonne. Some analysts point to a possible $170 a tonne by mid year, but further out producers – BHP thinks $85 long term, Fortescue more like $120 – point to softer prices as demand struggle to keep pace with massive new supply coming on stream over the next few years. But nobody comes close to the bearish predictions from UBS commodity analyst Tom Price. 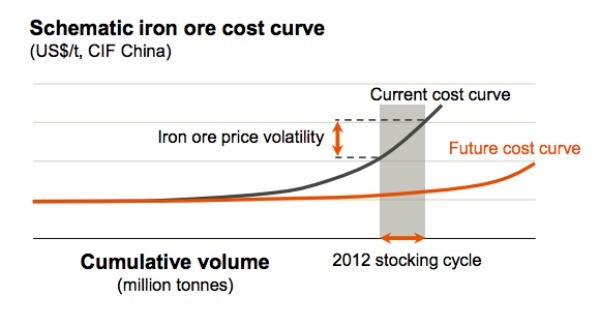 Price predicts iron ore to fall to $70 – that would be the lowest in four years – in the third quarter 2013 after trading around current levels through June. That will coincide at a time when China has “sufficient” ore and as steel production declines in the second half. The question of domestic Chinese iron ore supply is a vexing one for the industry. A price floor of $120 a tonne has become something of a rule of thumb – when prices stay below this level for long enough high cost mines in China become unprofitable leading to cuts in supply. With a cost curve ranging from as low as $40 a tonne – closer to the margins achieved Australian, Brazilian and South African producers – to as high $140, the predicted $70 would mean most of China's swing producers would be forced to idle mines. "All this may be a shock to international miners who are struggling to contain China costs in the face of exorbitant inflationary pressures." 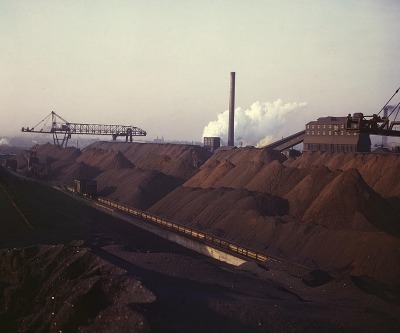 Image of Hanna furnaces of the Great Lakes Steel Coporation, stock pile of coal and iron ore, Detroit, Michigan from the Library of Congress.